Todd works with a high-profile clientele of elite professional athletes. This includes NFL MVPs, Super Bowl Champions and MVPs, Heisman Trophy Winner, Olympic and X-Game Gold Medalists, and many other champion athletes. He is a 2 Time Personal Trainer of the Year (IDEA & ACE) and has received numerous industry accolades. Greatist has named Todd one of the Top 100 Most Influential People in Health & Fitness for the past four years. His gym, Fitness Quest 10, was named one of “America’s Top 10 Gyms” by Men’s Health for the past 5 years, and in addition to high-profile athletes, attracts many fitness enthusiasts of all ages, shapes, sizes, and levels who want to improve their overall health and fitness performance. His team of 38 trainers, coaches, and therapists deliver results to over 500 clients weekly. Todd has appeared on 60 Minutes, ESPN, the NFL Network and has been featured in Sports Illustrated, USA Today, Men’s Health, Men’s Fitness, ESPN the Magazine, Stack Magazine, the NY Times, Wall Street Journal, Washington Post, and many others. He was also featured trainer on NBC’s hit fitness show STRONG. Through Todd Durkin Enterprises, Todd and his staff provide motivational and educational programs and team-building events to companies and conferences worldwide. Some of these companies include Under Armour, Gatorade, The Ken Blanchard Companies, YPO, Wells Fargo, Bath & Body Works, Cal-a-Vie Resort & Spa, the Golden Door, IMG, USMA, UCSD, UBS Warburg, Quest Ventures, Behr Paints, Kaiser Permanente, Torrey Pines Bank, Administrative Professionals, Life Care Solutions, and the San Diego Chargers. 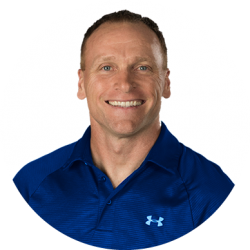 Todd earned his BS degree in Kinesiology from The College of William & Mary in Virginia and his MA degree in Exercise & Nutritional Science with a specialty in Biomechanics and Sports Medicine from San Diego State University. He and his wife Melanie reside in San Diego, CA, with their three children, Luke, Brady, and McKenna.